The trip consists of a visit to the open market of Chichicastenango on the first day. On the second day you will be visiting Panajachel and Lake Atitlan on a boat. In Chichicastenango you will be able to explore the indigenous market and be witness of the incessant exchange of fruits, vegetables and handicrafts between local people and foreigners. 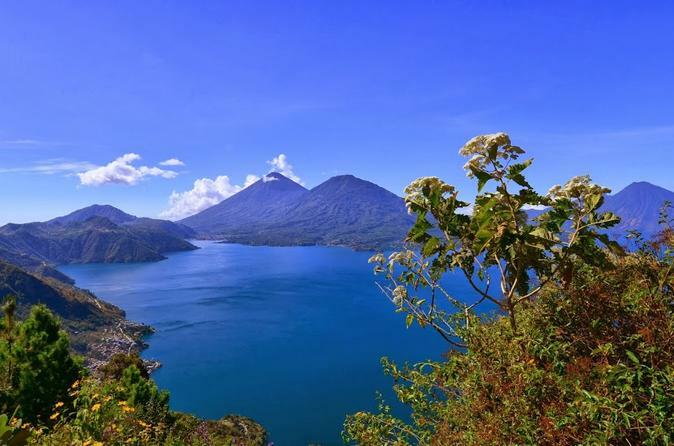 Lake Atitlán was formed when a volcanic caldera depleted of its magma. Three stately volcanoes, Atitlan, Tolimán and San Pedro rise gracefully from its southern shore, their perfect cones reflected in the azure mirror of the lake. Weaving made and worn by the Maya-Tzutujil and Cakchiquel women who live around the lake and many of the men also wear traditional, hand-woven clothing. 7:00am: Transfer from your Hotel in Guatemala City to Chichicastenango. 10:00am: Arrival to Chichicastenango’s Market. In the center of town is the local market where you can buy wood products, ceramics and even gifts that the Mayan priests offer on their prehispanic altars. You can also admire the Church of Santo Tomas which was built by Dominicans and Kichen in the year of 1540 on a Maya altar, which even today is used on the front steps of the church. On the other side is Calvary Church, in the square you can see a high stick where they have done each year the presentation of the Palo Volador. 12:30pm: Transfer from Chichicastenango to Lake Atitlan. 1:30pm: Time to have lunch in one of the most exquisite restaurants of Panajachel (not included). 2:30pm: Free time to relax and enjoy. 8:30am: After breakfast, we will take a private boat to cross Lake Atitlan and visit the Tzutuhil Village of Santiago de Atitlán. In this village you will visit the confraternity of the local saint named Maximon or Ri Laj Mam, visited by different people of different ethnicity who come to ask health and prosperity in their lives. Transfer back to Panajachel by boat. 2:30pm: Visit to the Santander Street of Panajachel and handycraft market of this town. 3:30pm: Transfer back to Guatemala City.